The RK05J Disk Drive is a removable media hard drive with a total capacity of 1.6 million 12 bit words. 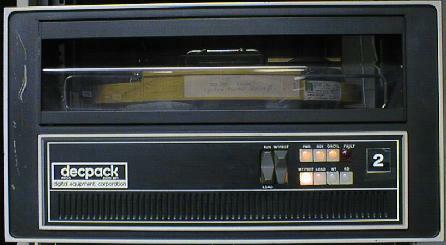 This was normally used with the PDP-8E type omnibus machines. It was attached to the computer with the RK8E 3 board set which transferred data using the omnibus data break. The heads are parked off the disk when the drive is shut down. The drive has a battery in it so the heads can be parked if the power fails. Videos of operation of RK05 drive. How to view The large realvideo files are the best but slow to download. The large MPEG has some artifacts from being recorded with interlaced video from a camcorder and is larger than the realvideo. Realvideo: large (746K) Small not available yet. MPEG: MPEG not available yet.